Baking tuesday really happened on Tuesday, but I didn’t get to post til today. Usually bananas go fast in our house, but for some reason this batch was sitting there going bad. This bread came out really good. Next time I would use more coconut and maybe sprinkle a bunch over the top before baking. Don’t forget about my giveaway! 1. Preheat oven to 325°F. Sift flour, baking powder, baking soda, salt, cinnamon, and nutmeg together, into a mixing bowl and set aside. 2. In a small bowl, mash bananas with milk. Set aside. 3. In another mixing bowl cream together butter and sugar, about 2 minutes. Scrape down sides of the bowl and add mix in eggs, one at a time. 4. Stir in the vanilla, followed by the banana mixture, until just combined. 5. Stir in flour mixture until just combined and fold in chocolate chips and coconut. 6. Grease a 9 inch loaf pan (or mini loaf pans) and add batter. 7. Bake for 1 hour 10 minutes to 1 hour 20 minutes or until a toothpick comes out clean when inserted into the center of the bread. 8. Allow bread to cool in pan for about 20 minutes before removing and allowing bread to cool completely. Slice and serve. usually we go through bananas and apples really fast in this house — but for some reason we had bananas going brown.. i think the husband has stopped eating bananas so that i HAVE to bake them into something! these are really good! really moist really delicious! make them! btw – nope i didnt forget the eggs.. there are no eggs in this recipe! Preheat oven to 350 degrees. Line a regular sized cupcake pans with cupcake liners and set aside. In a large bowl, whisk the flour, brown sugar, baking soda, baking powder, and salt. Stir in the oil; the batter will be very dry. Mash the bananas in a bowl and add them along with any of the accumulated juices and the chocolate chips to the flour mixture. Stir to combine. 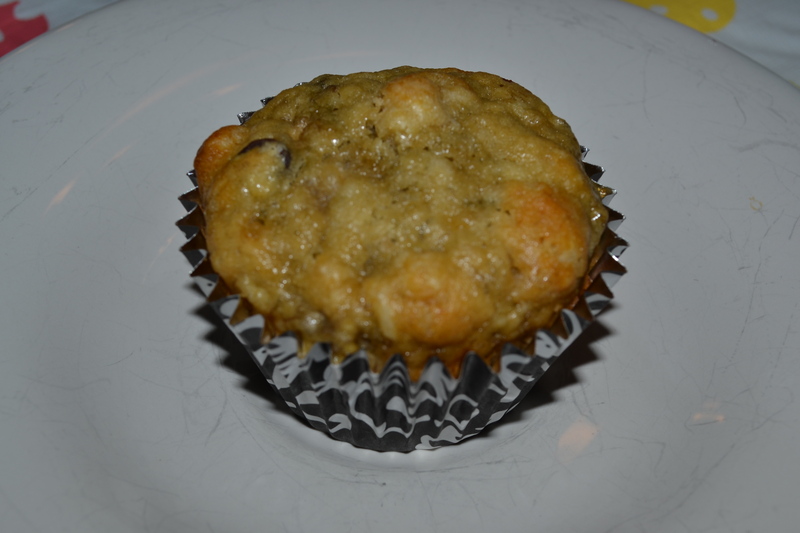 Fill the muffin papers almost to the top and sprinkle with a generous amount of sugar. Bake for 20 minutes rotating the pan once during baking. Let cool in the pan for 5 – 10 minutes then serve. when bumpkin told me she was posting a CAKE she baked for baking tuesdays i knew i’d have to take it up a notch…. she could be the next DUFF 🙂 i had some bananas that were screaming to be used up. when i searched through my banana recipes i debated between this one and one with browned butter frosting — the husband seemed to want something with chocolate so i went with this one! bananas and nutella??? it had to be a winner! 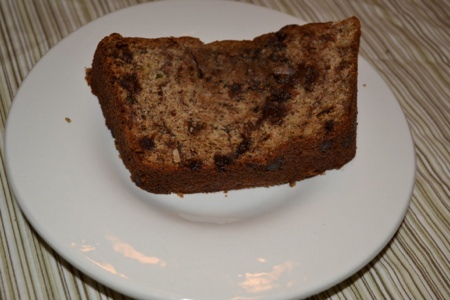 this definitely doesn’t taste like a dense banana bread – but more like a banana cake as the recipe title states. 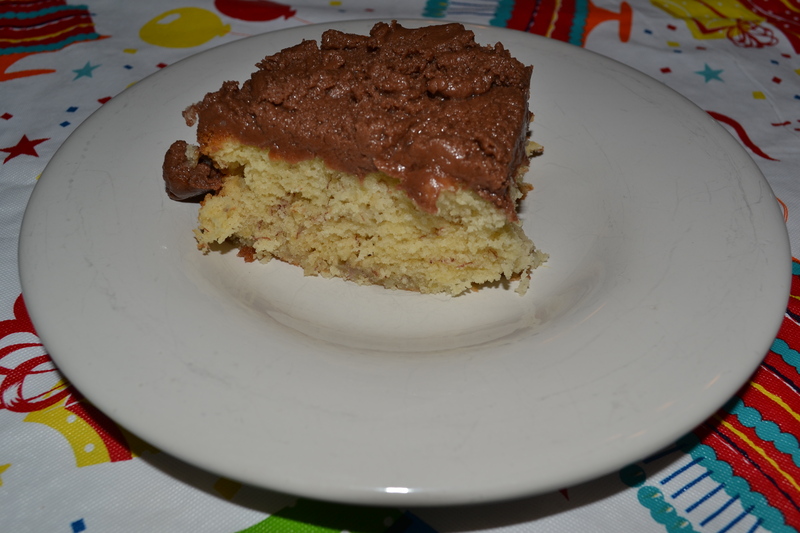 i also halved the frosting recipe — i couldn’t stomache using 1.5 cups of nutella… YUM! is the verdict! Preheat oven to 350 degrees F . Grease a 9×13 inch pan. Using a stand mixer with the paddle attachment, cream together the butter and sugar until light and fluffy, about 3 minutes. Beat in the eggs, one at a time, then stir in the sour cream, Lyle’s Golden syrup, and vanilla extract. Combine the flour, baking soda, baking powder, and salt and mix into the batter on low speed. . Finally, mix in the mashed banana. Spread evenly into the prepared pan. Bake for 25-30 minutes or until a toothpick inserted into the center comes out clean. Cool on a wire rack before frosting. In the bowl of your mixer fitted with the paddle attachment, mix cream cheese, Nutella, and butter until smooth. Add in the powdered sugar one cup at a time and mix until smooth and creamy, you may end up needing less or more depending on how sweet you like your frosting or the consistency you want it at.